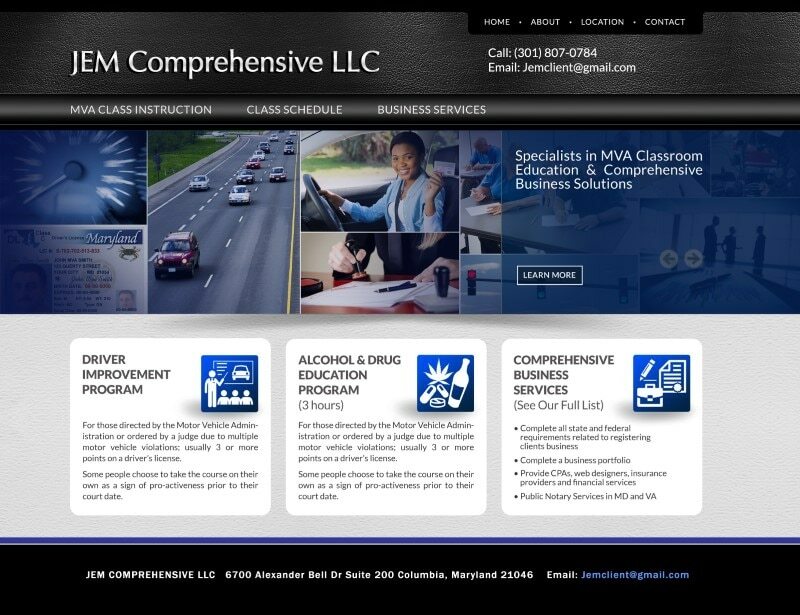 Best Website design in Maryland MD | The definitive source for website design for business. Best rated website design in MD. Read ratings and reviews on Google reviews for VISIONEFX as the clear choice for website design and development in Maryland. JEM Comprehensive wanted to partner with a company that understood their core business units; especially those units doing business with MVA. After JEM reviewed the VISIONEFX client list of business consultants website designs, they knew we were the perfect fit. Many of our website consulting clients are business professionals who require and demand the very best in website excellence. The website features class training pages, descriptions and customer inquiry form. Do you have an old Blog? Did you know that VISIONEFX can import legacy blog posts into a new Word Press website to preserve your SEO? When searching Website Design Maryland look no further than the design professionals at VISIONEFX. We provide a real-world approach and strategy for help you craft a unique visual message through your website to set you apart from the crowd. VISIONEFX develops and designs websites for business and provides web design in Virginia and throughout the USA. VISIONEFX, provides web design services to businesses throughout Maryland and the United States. Services include custom web design, E-commerce services, Word Press, SEO – Search engine optimization and web maintenance-repair services. Call: (757) 619-6456 or email info@visionefx.net. VISIONEFX also has the coveted Google 5 Star Review posted on Google My Business page.